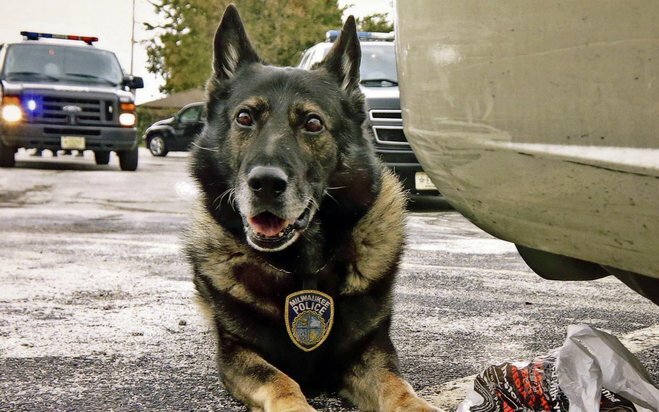 OrbsCorbs: "Milwaukee police dog remembered for toughness, tenderness"
"Milwaukee police dog remembered for toughness, tenderness"
Milwaukee Police Dog Kenny crouches by a bag of stolen cash he found after an armed robbery in October. "Eight years ago, Milwaukee Police Officer Christina Marshall looked into her new partner's dark brown eyes and made a promise. "Kenny lived with Marshall and her family when they were not patrolling the streets of Milwaukee. He was good at his job and never missed a day of work. Marshall credits Kenny with saving her life on several occasions. "Taking care of Kenny meant the difficult decision to end his life this week when he was diagnosed with inoperable kidney cancer. And Thursday night, Marshall and a room full of well-wishers gathered to celebrate the life of a four-legged officer who was remembered as a fierce police dog while on duty and a lovable cupcake at home. "Kenny was the first police dog in the area certified in three disciplines: to search for narcotics, firearms and people." RIP Kenny. Thank you for your service. Too bad Kenny never met up with the miscreant dog beater below. Labels: Crime, Dogs, JSOnline, Milwaukee, Pets, Police, R.I.P.